Warehouse workers are constantly exposed to hazards in the workplace that can easily threaten their lives or ability to continue living the lifestyle they’ve been accustomed to. Many of these workers are not even aware of just how many hazards they must encounter to perform their duties, which can include machinery, materials and trip and fall hazards. The Chicago work injury attorneys of Rosenfeld Injury Lawyers LLC can help you recover the compensation you need after a workplace accident so that you can continue to meet your financial obligations during your physical recovery. What Risks are Warehouse and Distribution Workers Exposed to Regularly? Working in a warehouse is demanding on workers, who are often in a fast-paced and stressful environment. In addition to needing to be aware of their surroundings at all times, they are often pushed to perform under unrealistic productivity standards. Whenever workers are rushed while operating with or around machinery or in an environment filled with hazards, it is a potential recipe for disaster. Some of the most common risks that these workers take include the following. Risk of injury due to falling objects— a lot of the product stored in warehouses is stored on pallets and racks, which can place it above the reach of workers. If workers are caught off guard when material falls onto them from above, it can result in serious injury. 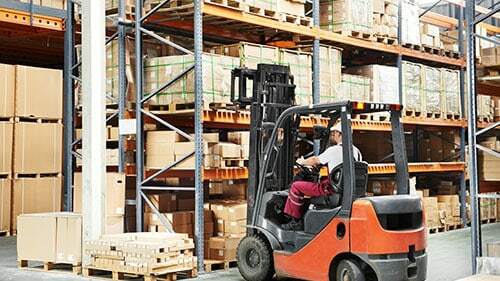 Forklift accidents— while forklifts are very effective and useful machines, they are also extremely heavy and powerful. Drivers need to be extremely careful not to collide with workers who are on foot and the irresponsible operation of a forklift can cause it to tip over or to fall off of a loading dock. Trip and fall risks— whenever working around a loading dock, workers risk encountering trip and fall hazards, whether it is due to an improperly secured trailer or the presence of product on the dock. Injuries during lifting— warehouse workers are required to pick orders for clients and this can involve a lot of lifting. Whether due to improper lifting technique or repetitive use of the same muscles, it is possible for workers to suffer serious injuries to their backs and spines. If you have been injured while performing your regular job duties, you have the right to receive worker’s compensation benefits, even if the accident was your own fault. Our Chicago worker’s compensation lawyers often handle these claims on behalf of workers who don’t want to argue with their employers over their claim or who want to make sure that they receive all of the compensation to which they are entitled. In the event that your injuries were caused because your employer was negligent or did not provide you with a safe work environment, it is possible for you to cover additional compensation for your injuries. Understanding your rights is important when you communicate with your employer or insurance companies following an accident, which is why it is important that you speak with an attorney and learn what your rights and recourses are. In many cases, your lawyer can communicate with your employer on your behalf to protect your interests. Rosenfeld Injury Lawyers LLC has the experience and resources you need to ensure you are able to recover the maximum amount of compensation the law allows for your injuries following a workplace accident. We have helped thousands of people with their worker’s compensation claims and sought justice on behalf of those whose injuries were due to poor workplace safety and employer negligence. We can help you examine all of the possible avenues through which you can recover compensation so that you are able to meet all of your financial obligations. Contact us today to arrange a free case review with an award winning Chicago workplace injury attorney today. We work solely on a contingency basis, so we will never accept payment for our services unless we have secured compensation on your behalf.